A surefire amalgam of rich heritage, lush landscapes, glorious food culture and vibrant modern cities, it is not difficult to see why South India should be the destination for your next India trip. The heartbeat of the country, South India sits in clear contrast to the country’s north. 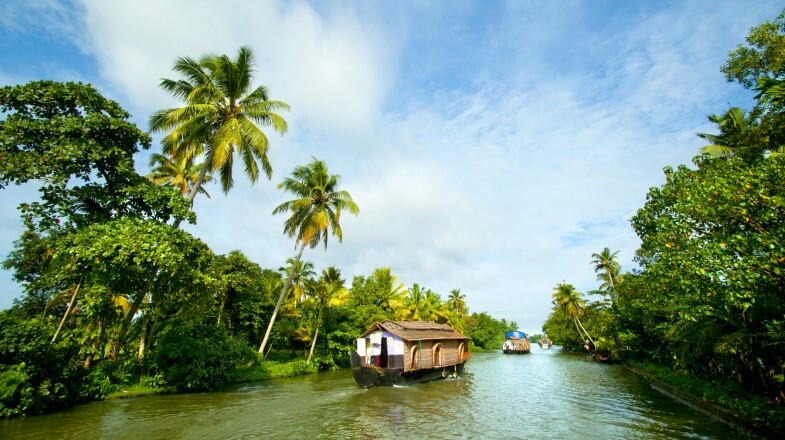 Prepare to explore age-old shrines and structures, immerse yourself in colorful culture and gastronomy, and get lost in scenic coastlines, palm-fringed backwaters and rolling hills. Here is a guide to discovering all that the region has to offer, including recommended places, South India tour packages, suggested itineraries and more. 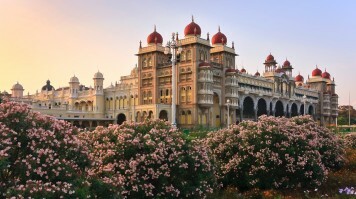 Kick off this 13-day tour with a city tour of Bangalore, the capital of Karnataka. After exploring its art and technology scene, take off for a tour of Southern India through a wildlife safari ride at Bandipur National Park and see the layers upon layers of tea plantations in Munnar. 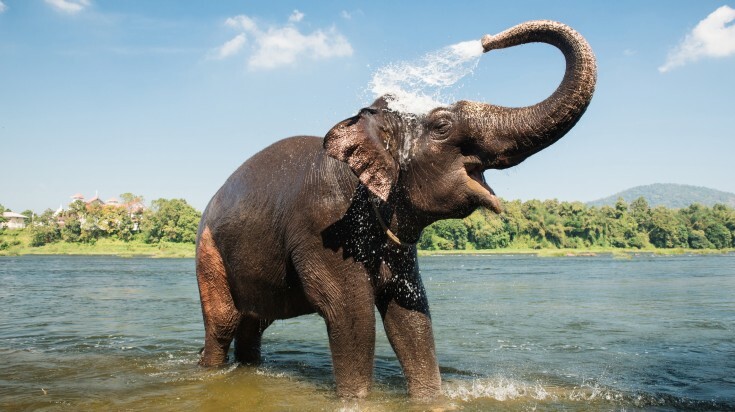 Before it’s over, make sure to jump on top of an elephant in Mysore. Put a cap on this South India tour package with a mandatory Kathakali dance show in Cochin. This unique blend of tourist gems and hidden places is ideal for travellers of all kinds. 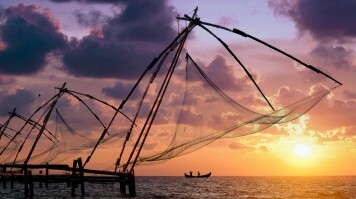 Take this 15-day tour across South India beginning and ending in Cochin. 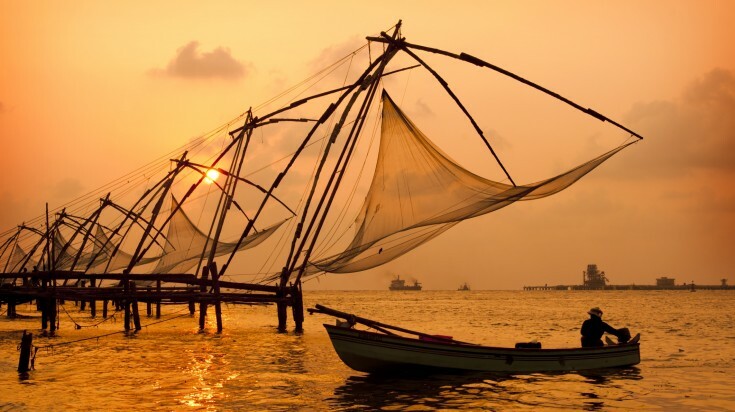 Known as the Queen of the Arabian Sea, Cochin is a stunning reflection of influences from Dutch, Portuguese, Chinese and English cultures. 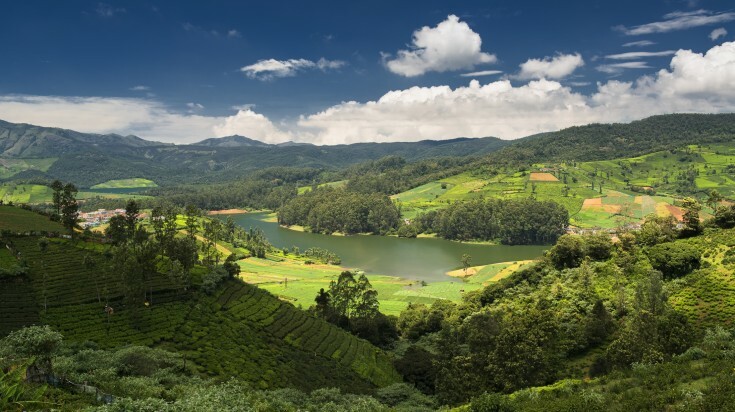 Traverse through the deep waterfalls, tea plantations and spice markets that have put South India on the map. Explore the Western Ghats and tropics of India’s southern region. Retreat to the quiet wildlife of the many sanctuaries, notably Periyar National Park for the perfect tour of India’s most diverse area. This tour starts in Cochin and ends in Kolkata. Enjoy an express two-week trip around some of India’s best-kept secrets. From discovering the village life through the Kerala backwaters and running along the tip of Kanyakumari and throughout the temples, to exploring palaces that dot the eastern shoreline, this South India tour will take you on an adventure of a lifetime. This tour is perfect for those who want to take the road less travelled, visiting smaller cities while hitting the hotspots in between. Starting in Trivandrum, this 16-day tour takes you through the beaches and backwaters of southern India. 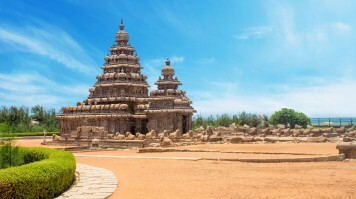 From the religiously enshrined temples to coconut groves, fishing villages and ancient ruins — this tour will reveal all of South India’s greatest. Find time to munch on some special South Indian cuisine like chutney, seafood curry, and dosas before resting on the serene beaches of Goa where you’ll end your trip. Take the classic route down India’s south, visiting the old town of Chennai onwards to the spice region of Cochin into the temples of Kanchipuram and hill stations of Nigiri Hills. This premium tour takes festivals and events into account, where you’ll celebrate with locals along the Malabar coast, catch a houseboat down Kerala and visit some of India’s most legendary corners of the south. A trip is never left without local cuisine as well as visiting the vibrant towns of Ooty and Coonoor before returning to Chennai to end the tour. South India is filled with amazing destinations — some popular and touristy, some very off-the-beaten-path and local. If you are venturing into South India for the first time, we recommend the following 5 places to start off your journey. A beautiful collision between urban hip, exquisite ancient ruins, quaint villages, and emerald landscape, Karnataka is a hidden gem that many tourists overlook in favour of its popular neighbours but really should not. Home to a myriad of attractions, Karnataka is the place to be for explorers. Spot tigers in Bandipur National Park, take a step back in time at Hampi, marvel at the impressive royal palaces in Mysore and get inspired along the winding trails of spice and coffee plantations in Coorg. This is undoubtedly one of the best places to visit in South India. Whether you are in need of a relaxing holiday or a mystical one, Tamil Nadu is the go-to-destination in South India. Featuring stunning coastlines, lush hill stations, cultural abundance and some of the finest stonework, there is no lack of activities to indulge in — from hikes to cultural exploration or water activities. Journey through the well-kept gardens, ancient temples and villages that make up the southern state and immerse yourself in the dance, language and poetry of its people. 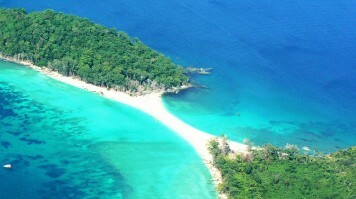 There are 572 islands to be explored in Andaman and Nicobar. 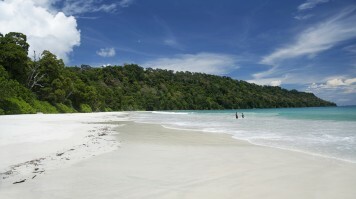 Floating on the Bay of Bengal, around 966 km away from India’s mainland, is Andaman and its neighbour, Nicobar. The two are peaks of a mountain range that runs from Myanmar to Indonesia, which once stood tall and is now submerged in water. Known for its rare biodiversity and home to six indigenous tribes, the Andaman and Nicobar Islands are famous for their distinct flavour and make a perfect Indian escape. Boasting serene blue waters, white sand beaches and emerald green jungles, the islands sets the desired milieu for a relaxing getaway. A cluster of 36 white-sand-beached, palm-lined islands makes Lakshadweep a rewarding destination in South India. Situated on the Arabian Sea, Lakshadweep flaunts unspoiled coral reefs and underwater lagoons that are a big attraction amongst scuba divers and snorkelers. If you are aching for beautiful waters, isolation, and an island experience like none other, the hidden gem of Lakshadweep is the place to be. The narrow coastal strip of Kerala in South India is your escape from the boisterous madness of the rest of India. 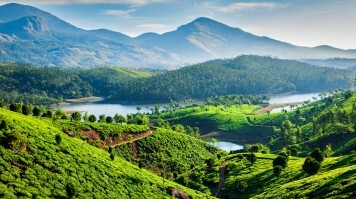 Boasting a network of glistening backwaters, a stretch of beaches lined with palm trees, and green hill stations covered with tea and spice plantations, Kerala is a different world in its own. Allow yourself to strip away from the bustling city life and dive deep into the villages of Kerala to experience a slower way of life. 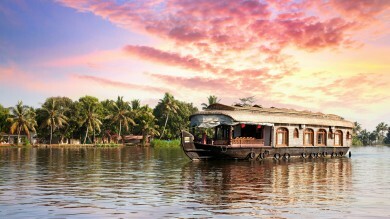 Top it all off with a boat ride through the shaded backwaters of Cochin, Karasagod, and Kollam. 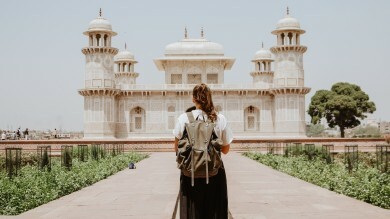 If a pre-designed tour to South India is not your cup of coffee, you can always create your own itinerary with places you want to visit and activities that scream at you the most. Here is an example of a customized itinerary to help you plan your own. Start early and take the short hour-and-a-half train trip to Kanchipuram, also known as the “Golden City of a Thousand Temples”. Enjoy the morning exploring the many temples that encompass the city, namely Kamakshi Amman, Kailashnath, Vaikuntha and Ekambareswarar. 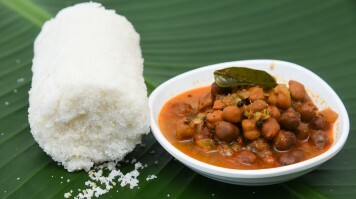 When the temples get overwhelming, try puttu, a rice dish layered with coconut and served with luscious spicy curry. In the afternoon visit the silk market and learn about the fabrics that make up saris and perhaps try wearing one too. Take one home for souvenir sake! Head back to Chennai to stay the night. Board an early hour-long flight to Madurai, India’s version of Athens. One of the oldest cities in India, Madurai’s many attractions include the world famous Meenakshi Amman Temple. Marvel at the intricately carved, colourful structure in the morning and pay respects to the deity that is believed to reside there. Spend the rest of the day exploring the medieval remnants in the city. Be sure to check out the Thirumalai Nayakkar Palace and learn more about Gandhi at the local Gandhi Museum. 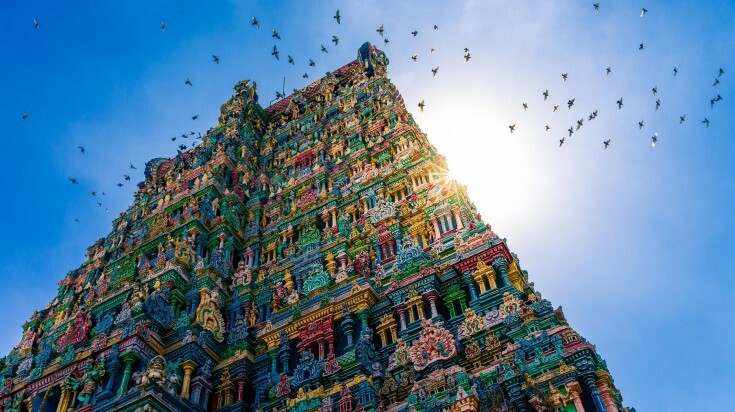 Before calling it a night, visit the Meenakshi temple again in the evening to witness a larger-than-life Aarti ceremony — a special ritual that involves lighting oil lamps to illuminate the entire temple premise. Prepare for a 3-hour long road trip to Periyar National Park. 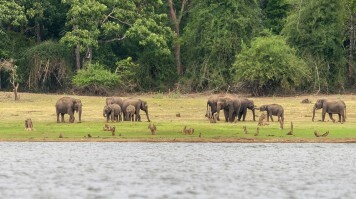 An elephant and tiger reserve, Periyar National Park is popular amongst tourists. Spread over 777 square kilometres, the reserve is also home to wild boars, sambars, bison, and several species of birds. Spend most of the morning and afternoon journeying through its rolling hills to spot all the wildlife to your heart’s content. Then, in the evening, spend some time visiting the spice plantations around. Grab some cinnamon and cardamom to take home. If you’ve booked accommodation in a hotel inside the park, stay the night there. If not, there are plenty of nice spots outside the park as well for the night. Embark on a four-hour long train journey to Kumarakom. Located in the region of Kerala this vintage town is famed for its calm demeanour and quieter waters compared to its sister Alleppey. Made of a cluster of small islands on the Vembanad Lake, Kumarakom is also known for its 14-acre bird sanctuary. Spend the morning exploring the sanctuary of migratory birds such as the famous Siberian Stork, heron and local species such as the waterfowl. 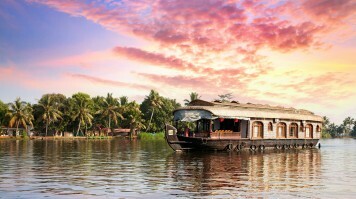 But the best part of a trip to Kumarakom is definitely a houseboat tour of its enchanting backwaters. Grab dinner at a local eatery before you retire for the night. 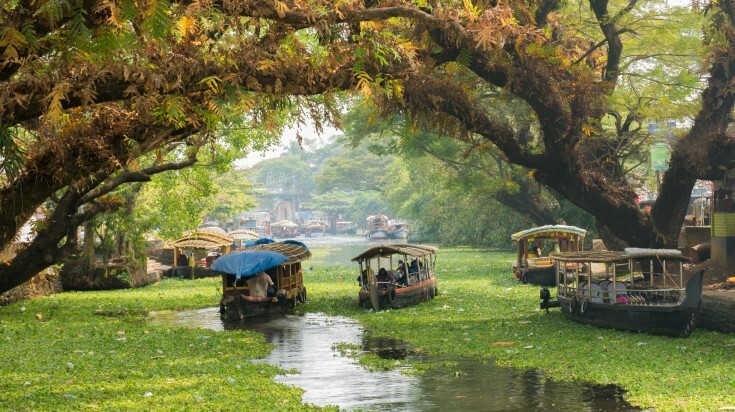 An hour and a half’s drive away from Kumarakom, Cochin is known for its diverse mix of heritage. A medieval melting pot, Cochin flaunts its influences from Chinese, Dutch, and Portuguese culture with Islamic undertones. Spend the morning immersed in the multi-cultural communities and local architecture. For lunch, indulge in local dishes where fresh seafood plays the main hero. Head down to the many beautiful beaches that surround the port city. Be sure to make a stop to Cherai Beach. Dip your feet into the shallow waters and clean sand, with rolling rocks and knolls that overlook the waves. 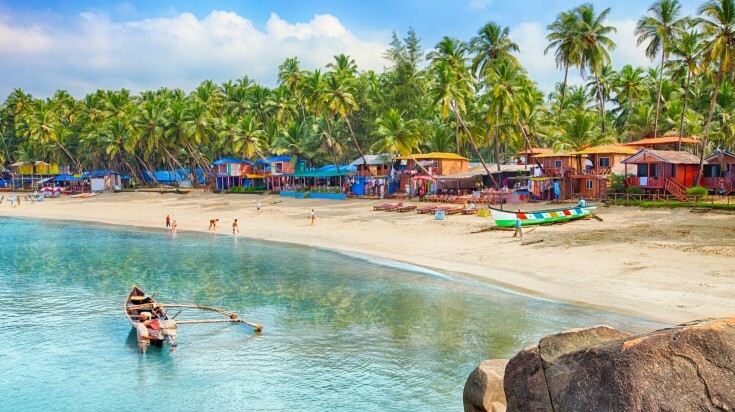 End your trip on a two-hour flight to Goa from Cochin, a place known for its uninterrupted golden beaches that stretch along the Arabian coastline. Find hidden coves, crabs, palm trees and markets along the many beaches of Goa. Unwind at Cavelossim beach to enjoy the end of the trip or take a scooter around Old Goa, soaking in the history of the region that once served as the capital of Portuguese India. Spend your afternoon eating away at the many stalls that line the main street, perusing through flea markets until your feet are done. End your night exploring an old school Goa party and the birthplace of psychedelic trance. Make sure you try the Goan fish curry, a local specialty made of your preferred seafood and coconut and red chilli sauce. Contact us to create your perfect, customized trip itinerary to South India. While beef is sacred meat in India and not easily available, Kerala is one of two states that is licensed to serve beef. So, make sure to get your share when you’re there. Only go swimming off the beaches from November to May. Times outside of those months can see currents rise up and it may become dangerous to dive in. The best time to visit South India is during winter (December to February) when the weather is not scorching hot. Pack a lot of breathable, cotton clothes, as South India is hot and humid even on its best days. Take at least one item of local clothing with you, or buy something on arrival. Some temples in South India won’t allow you in if you are not wearing traditional clothes. A trip to South India — from lush green hills to sandy coastlines, enchanting backwaters, architectural marvels and historic grandeurs — will be an unforgettable experience. 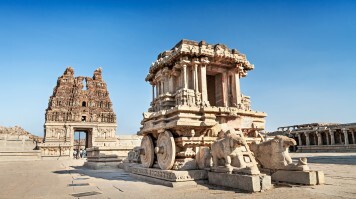 Jump on one of our South India tour packages or create your own, unique South India itinerary; whatever you do, do not procrastinate on traveling to this amazing destination.